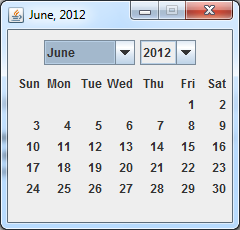 I've developed a Java calendar program which is based on Swing concept. Below the screenshot of my program. This program has two panels, one to hold the combo boxes and other one to hold the labels to display dates/days. I've implemented an ItemListener which will be fired when user chooses a value from the ComboBox. itemStateChanged method invokes my method drawCalendar(), which will take care of removing all the existing elements from the Panel and adding the days and dates based on user selection. By default, the current month's calendar will be displayed. This has been tested on Java 1.5 and 1.6 versions of Sun Microsystem's Java.